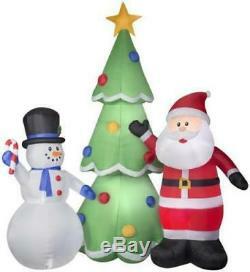 Gemmy Air Blown® Inflatable Colossal Santa & Snowman Christmas Tree Scene! 13' Tall x 12' Wide x 8' Deep! Show All The Neighbors Who Has The Best Display This Year With This Giant Colossal Santa & Snowman Christmas Tree Scene! This Gemmy Air Blown Inflatable Christmas Decoration comes with a built in fan, internal lights to create a glowing night-time display, yard stakes, stand and tethers. Great Birthday Present, Christmas Gift or Stage prop! UL listed for indoor-Outdoor Use. THANKS FOR LOOKING AND HAPPY SHOPPING. The item "Christmas Air Blown Inflatable Huge 13' Santa & Snowman with Xmas Tree Yard Decor" is in sale since Friday, March 23, 2018. This item is in the category "Collectibles\Holiday & Seasonal\Christmas\ Current (1991-Now)\Yard Décor". The seller is "giftsaroundtheworld-2008" and is located in Canton, Ohio.